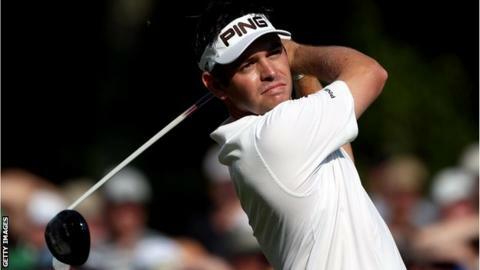 Louis Oosthuizen takes a three-shot lead into Monday's final round of the Deutsche Bank Championship after shooting a superb 63 at TPC Boston. The South African fired seven birdies in succession from the fourth for a tournament-record 29 on the front nine. Playing partner Rory McIlroy started the day on top of the leaderboard and birdied the first two holes. But the world number one could only card 67 to finish 16 under par overall, with Oosthuizen in the driving seat. "Louis put on a display right there," McIlroy said. "I've come from farther behind before. It's going to be an interesting day tomorrow." Oosthuizen admitted he was dreaming of hitting a round of 59 by the time his birdie went in on the 10th. But the 29-year-old's putting faltered as he followed up with six pars and a bogey, before finishing with another birdie on the par-five 18th. "I gave myself good chances to post that number," said Oosthuizen. "I got the start anyone would dream of. I made everything. You get these days where you just look at a putt and hole it." Dustin Johnson continued his quest for a Ryder Cup US team wildcard with a 65 to move into third place on 13 under alongside Tiger Woods, who carded a 68. Ian Poulter endured a day to forget as he carded a four-over-par 75 to finish at evens, while Lee Westwood hit 69 to move to five under and Luke Donald's 70 left him on four under. Northern Ireland's Graeme McDowell and Ireland's Padraig Harrington both carded 75 to finish on six over. The leading 70 players on the FedExCup points list after this event advance to the BMW Championship, with the top 30 then progressing to the Tour Championship finale in Atlanta, where the overall points winner pockets a $10m (£6.3m) bonus. Is McIlroy golf's next superstar? Read more on Will Rory McIlroy be the next superstar of golf?